It appears that we are entering the era of flawed democracies. Our country, Canada, remains firmly in the category of full democracy. But that is no longer true south of the border. In an annual survey by The Economist, the United States slid down the list (and this is based on data from 2016, before Trump’s inauguration). 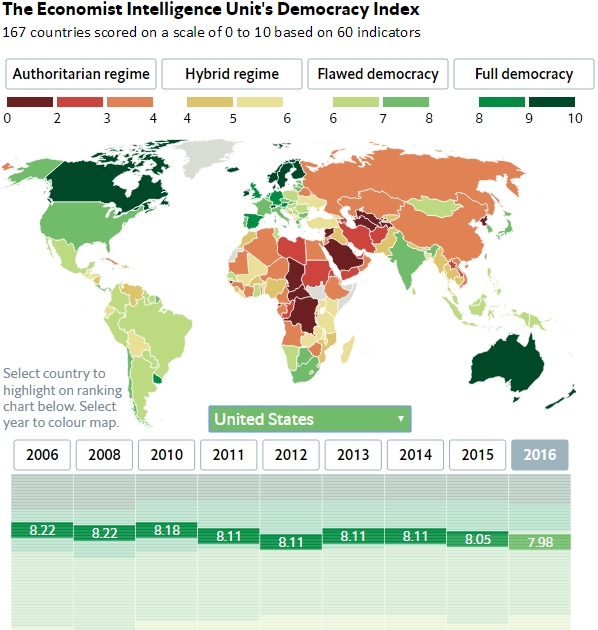 It is now one of the leading flawed democracies, with a democracy score virtually identical to that of Japan. And even as the number of full and flawed democracies, put together, remains roughly the same (80 in 2008, 75 in 2016 if I counted correctly), the number of full democracies is rapidly shrinking. There were 28 full democracies on the list back in 2008; by 2016, this number shrank to 19, a more than 30% decrease in just eight years. Meanwhile, the examples of India and Mongolia demonstrate that democracy is not just a privilege for the rich. These countries are decidedly third world economies with GDP per capita roughly one tenth that of Canada or the US, yet they manage to maintain democracies no more flawed than the regimes on the eastern fringes of the European Union, such as Hungary or Romania.